Whiplash is an acceleration-deceleration mechanism of energy transfer to the neck. It may result from rear-end or side-impact motor vehicle collisions, but can also occur during sport (diving, snowboarding) and other types of falls. The impact may result in bony or soft-tissue injuries (whiplash injury), which in turn may lead to a variety of clinical manifestations called Whiplash Associated Disorders (WAD). It is estimated that about 30% to 50% of patients who sustain a symptomatic whiplash injury are going to report chronic, and potentially more widespread symptoms, classified as WAD. WAD is a good example of a medical condition where there is often an apparent disconnect between the magnitude of injury and the magnitude of disability. Several lesions may occur, depending on the movement of the head during the accident. These lesions ranks from severe to moderate to slight. Hyperextension is the most common mechanism, followed by hyperflexion and lateral flexion. Hyperextension and distraction of the neck may rupture the anterior longitudinal ligament and also some discs. A ruptured disc can lead to backward displacement of the vertebra lying above it (the upper facets then slide downwards on the lower) with damage to the spinal cord as a result. Spinal cord injuries after motor vehicle accidents occur most often in young car users in the 15–24 year age group. Pure hyperextension may also lead to compression of the spinal cord in those cases where retrolisthesis or spinal stenosis already existed. Compression fractures of the posterior elements may occur in other cases. Hyperflexion injury may lead disruption of posterior ligaments and occasionally facet joint luxation and/or to fractures of the vertebral body (most fractures of the atlas and of the axis are the result of motor vehicle accidents). Less likely, lesions of veins, arteries, neural structures, oesophagus and retropharyngeal tissues may occur. Less severe lesions which may involves the intervertebral discs, the zygapophyseal joints, the cervical ligaments and muscles are much more frequent. These lesions may occur in isolation but are more often combined and therefore are sometimes difficult to recognize. The common complaint is neck pain. According to recent retrospective studies, the occurrence of disc lesions after whiplash injury is quite high and one prospective study indicates the value of clinical diagnosis. Most disc lesions are ruptures of the anterior annulus fibrosus and endplate avulsions. As the result of the hyperextension element during the trauma the disc may have fissured. The subsequent flexion or hyperflexion element causes displacement of disc material in a posterior direction. Davis et al describe a number of posterolateral disc lesions with radicular symptoms as the result of a hyperextension whiplash trauma. These herniations seemed to develop only after the acute phase and it took a few weeks for the radicular symptoms to manifest. In postmortem studies, Taylor et al describe the intervertebral disc as the most frequently damaged structure. Jónsson et al also confirmed the large number of disc lesions after whiplash, and during surgery were able to confirm the findings from magnetic resonance imaging (MRI). Posterocentral protrusions lead to central, bilateral or unilateral pain in a multisegmental distribution: pain in the neck, upper scapular area and trapezius. On examination, a symmetrical (mimicking a full articular pattern) or asymmetrical pattern of limitation is evident. In acute cases the picture may be torticollis-like. Whiplash may also lead to problems at the level of the zygapophyseal joint capsules. Lord et al undertook a placebo-controlled prevalence study after whiplash and found that chronic cervical facet joint pain was common. Pain which is usually localized is felt unilaterally. A convergent or divergent motion pattern may occur, although any asymmetrical pattern is compatible. Minor lesions can occur when ligaments can become overstretched, or may become adherent as the result of post-traumatic immobilization. They manifest with vague stretching pain felt at the end of range of those movements that stretch the ligament. Muscular lesions which are mostly anterior are described in clinical studies, on echography( the use of ultrasound as a diagnostic aid), in experiments in animals and in postmortem studies. Muscles, especially their occipital insertions, can be strained during injury. The subsequent pain will be quite localized and can be reproduced during either contraction or stretching. WAD is considered to be "the most common nonhospitalised injury resulting from a road traffic crash". Based on several studies, we can conclude that the prevalence of WAD depends on the country or the part of the world. For example, the prevalence per 100,000 inhabitants is of 70 in Quebec, 106 in Australia and 188–325 in the Netherlands. But according to the study of Versteegen, in which he studied patients with neck pain following a car accident in the last ten years, the prevalence per 100,000 inhabitants increased significantly from to 3.4 in 1974 to 40.2 in 1994. A study by Richter also shows an increase in prevalence of 20% between 1985 and 1997. The increase is due in part to a higher number of cars on the roads, which in turn can lead to more accidents. However, this increase in prevalence is also due to the fact that there is a greater public awareness of WAD and therefore those affected are more likely to consult their doctor and therefore the number of patients seeking healthcare for whiplash is on the rise. severity of the impact, however, it is difficult to obtain objective evidence to confirm this. neck pain present before the accident is a risk factor for acute neck pain after collision. women seem to be slightly more at risk of developing WAD. Age is also important; younger people (18-23) are more likely to file insurance claims and/or are at greater risk of being treated for WAD. There are many prognostic factors that determine the evolution of WAD and the likelihood that it will evolve into chronic pain. Pre-collision self-reported unspecified pain, high psychological distress, female gender and low educational level predicted future self-reported neck pain. no postsecondary education, older age, female gender, history of previous neck pain, baseline neck pain intensity greater than 55/100, presence of neck pain at baseline, presence of headache at baseline, catastrophising, WAD grade 2 or 3, and no seat belt in use at the time of collision. If the patient was out of work before the accident, sick-listed, or had social assistance, this can also be associated with a negative evolution following whiplash trauma. Illness notification before the accident can also be associated with neck pain in the future. Baseline disability has a strong association with chronic disability, but psychological and behavioural factors are also important. Whiplash-associated disorders, is a complex condition with varied disturbances in motor, sensorimotor, and sensory functions and psychological distress. The most common symptoms are sub-occipital headache and/or neck pain that is constant or motion-induced. There may be up to 48 hrs delay of symptom onset from the initial injury. One of the most common clinical characteristics is a restricted range of motion of the cervical spine. This finding may reflect underlying disturbances in motor function due to the initial peripheral nociceptive input caused by injured anatomical cervical structures. Further research of such potential mechanisms in WAD is necessary. Another characteristic is altered patterns of muscle recruitment in both the cervical spine and shoulder girdle regions. This is clearly shown to be a feature of chronic WAD. Sensorimotor dysfunction is greater in patients who also report dizziness due to the neck pain. It is important to carry out thorough spinal and neurological examinations in patients with WAD to screen for delayed onset of the cervical spine instability or myelopathy. Whiplash can be an acute or chronic disorder. In acute whiplash, symptoms last no more than 2-3 months, while in chronic whiplash symptoms last longer than three months. Patients with acute WAD experience widespread pressure hypersensitivity and reduced cervical mobility. Various studies indicate that there can be a spontaneous recovery within 2-3 months According to the Quebec Task Force of WAD (QTF-WAD), 85% of the patients recover within 6 months. In addition, according to a follow-up study by Crutebo et al. (2010), some symptoms were already transient at baseline and symptoms such as neck pain, reduced cervical range of motion, headache, and low back pain, decreased further over the 6 months period. They also investigated the prevalence of depression and found that at baseline this was around 5% in both women and men, whereas post traumatic stress and anxiety were more common in women (19.7% and 11.7%, respectively) compared to men (13.2% and 8.6%). The majority of all reported associated symptoms were mild at both baseline and during follow-up. The Quebec Task Force was a task force sponsored by a public insurer in Canada. This Task Force developed recommendations regarding the classification and treatment of WAD, which were used to develop a guide for managing whiplash in 1995. An updated report was published in 2001. Each of the QTFC grades corresponds to a specific treatment recommendation. Lower cervical spine syndrome (LCS) accompanied by cervical and cervicobrachial pain. Cervicoencephalic syndrome (CES) characterized by headache, fatigue, dizziness, poor concentration, disturbed accommodation, and impaired adaptation to light intensity. In comparison with the QTF classification, this system of classification incorporates neuropsychological symptoms. WAD can be diagnosed based on the mechanism of the injury and clinical presentation of the patient, . There are no specific neuropsychological tests that can diagnose WAD. However, there are several psychological symptoms, as described above, that are associated with WAD. In addition, a whiplash profile has been developed with high scores on sub-scales of somatisation, depression and obsessive compulsive behaviour in patients with WAD. MRI is not indicated at the time of initial presentation because of the high false positive results. X-ray should be routinely used for the patients with WAD grade III and IV. If the X-ray gives positive results for fracture or dislocation, the patient should be immediately referred to an emergency department or to a specialist surgeon. Canadian C-Spine Rule (CCR) is an algorithm to determine the necessity for cervical spine radiography in alert and stable patients with trauma and cervical spine injury. The assessment of individuals with WAD should follow the normal cervical examination. Physical examination is required to identify signs and symptoms and classify WAD according to the QTF-WAD. During palpation, stiffness and tenderness of the muscles may be observed. These physical symptoms are present in grade 1, 2 and 3. Trigger points may also be observed in grade 2 and 3 WAD. The number of active trigger points may be related to higher neck pain intensity, the number of days since the accident, higher pressure pain hypersensitivity over the cervical spine, and reduced active cervical range of motion. In grade 1 WAD, there are no physical signs, so there will be no decreased ROM. In grades 2 and 3, a decreased ROM can be identified by testing the neck flexion, extension, rotation and 3D movements. To distinguish grade 3 from grade 2, neurological examination is needed. Patients with grade 3 have symptoms of hypersensitivity to a variety of stimuli. These can be subjectively reported by patients, and may include allodynia, high irritability of pain, cold sensitivity, and poor sleep due to pain. Objectively, the results of the neurological examination are hyporeflection, decreased muscles force and sensory deficits in dermatome and myotome. These responses may occur independently of psychological distress. Other physical tests for hypersensitivity include pressure algometers, pain with the application of ice, or increased bilateral responses to the brachial plexus provocation test. It is important to know that these neurological symptoms do not necessarily indicate peripheral nerve compression and may be a reflection of altered central nociceptive processes. These findings may be important for the differential diagnosis of acute whiplash injury. A poorer outcome is generally predicted in patients with higher initial pain and disability as well as hypersensitivty (e.g. cold hyperalgesia). “In recent years, there has also been extensive research undertaken demonstrating movement, muscle, and motor control changes in the neck and shoulder girdles of patients with neck pain, including WAD. Study findings include inferior performance on tests of motor control involving the cervical flexor, extensor and scapular muscle groups when compared to asymptomatic control participants; changes in muscle morphology of the cervical flexor and extensor muscles; loss of strength and endurance of cervical and scapular muscle groups; and sensorimotor changes manifested by increased joint re-positioning errors, poor kinaesthetic awareness, altered eye movement control, and loss of balance. Detailed information on the clinical assessment of cervical motor function is available elsewhere. The rationale for the evaluation of such features is to plan an individualised exercise program for each patient based on the assessment findings.” . The cervical facet joint can be a source of pain in individuals with chronic WAD. Animal studies have demonstrated that cervical facet joint injury may be responsible for hypersensitivity and increased neuronal excitability. Pain from the cervical facet joint can be medically managed using steroid injections to the specific zygopopsyal joints. Steroid injections can be used to treat acute and chronic WAD. However, there are conflicting findings on the possible outcomes from such treatment. Pettersson et al. suggests that a high dose of methyl-prednisolone therapy given to the patient within 8h after injury minimises the chance of developing chronic WAD. It is not often used because of the practical difficulties of this treatment (8h limitation, 23-h infusion, need for hospitalisation, cost). The nociception input from the cervical facet joint can be modulated via radiofrequency neurotomy (RFN). The radiofrequency neurotomy is a neuroablative procedure used to interrupt nociceptive pathways and uses heat generated by radio waves to target specific nerves (medial branch emitted by dorsal ramus) and temporarily interfere with their ability to transmit pain signals from the facet joints. The RNF can improve the pain, disability widespread hyperalgesia to pressure and thermal stimuli, nociceptive flexor reflex threshold, and brachial plexus provocation responses as well as increased neck range of motion one month and up to 3 months after the RFN. A prospective study with chronic WAD patients who underwent CRFN treatment, showed an improvement in 70% of patients based on a number of parameters including Neck Disability Index and cervical range of motion . Botulinum Toxin-A (BTX-A) decreases muscle spasm that contribute to both pain and dysfunction. Pain and range of motion with patients with chronic grade 2 WAD improves 2 to 4 weeks post treatment. The effect of the Botulinum toxin lasts nearly 8-12 weeks. Most patients treated with Botulinum toxin require repeated injections over many years. Other interventions are sterile water injections, saline injections, dextrose, lidocaine intra-articular injections and epidural blood patch therapy. However, it is not clear whether these treatments are actually beneficial. Further research is required to determine the efficacy and the role of invasive interventions in the treatment of chronic WAD. A study by Jonsson et al. (1994) found that 20% of patients had a protrusion of a cervical disc of grade 3 or grade 4 on MRI which correlated with neurological findings after a whiplash injury. Such patients might need to undergo anterior cervical discectomy. After the discectomy, the surgeon might need to permanently stabilise the cervical spine. This can be achieved using artificial cervical disc or fusion of the cervical vertebrae. Cervical discectomy and anterior cervical fusion can also be used to treat chronic WAD if the non-invasive treatments (including multimodal physical therapy) did not provide satisfactory results. Indications for surgery include severe and prolonged headache, neck and radicular pain if the symptoms identified during the clinical examination are in agreement with the radiographic findings. Management approaches for patients with WAD are poorly researched. Very often these patients do not fit into treatment categories as defined for other cervical pain problems due to multiple factors, and even within the WAD group there are multiple variances which warrant individualised treatment approaches. Whiplash-associated disorder is a debilitating and costly condition of at least 6-month duration. Although the majority of patients with whiplash show no physical signs, Studies have shown that as many as 50% of victims of whiplash injury (grade 1 or 2 WAD) will still be experiencing chronic neck pain and disability six months later. In most cases, symptoms are short lived. Only a substantial minority goes on to develop LWS (late whiplash syndrome), i.e. persistence of significant symptoms beyond 6 months after injury. Available data suggest that the combination of the injury with psychological factors such as coping style and explanatory style may lead to chronic WAD. Treatment for acute whiplash can be delayed due to multiple social, economic, and psychological factors. Psychological factors such as depression, anxiety, expectations for recovery, and high psychological distress have been identified as important prognostic factors for WAD patients. Coping strategies such as diverting attention and increasing activity are related to positive outcomes. Another review with a high evidence level recommends that patients suffering from acute WAD “act as usual” and do early, controlled, physical activity within their tolerance level. The target of education is removing therapy barriers, enhancing therapy compliance and preventing and treating chronicity. There is strong evidence that to reduce pain, disability and improve mobility both verbal education and written advice are helpful. According to Meeus et al., in acute patients oral information is equally as efficient as an active exercise program. In subacute or chronic patients, a programme integrating information, exercises and behavioural programmes, and a multidisciplinary programme, seem necessary. For more information on this refer to the section on chronic WAD. Oral Education: there is strong evidence for providing oral education concerning the whiplash mechanisms and emphasising physical activity and correct posture. It has a better effect on pain, cervical mobility, and recovery, compared to rest and neck collars. Furthermore, studies show that oral education could be as effective as active physiotherapy and mobilisation. Educational video: A brief psycho-educational video shown at the patient's bedside seems to have a profound effect on subsequent pain and medical utilisation in acute whiplash patients, compared to the usual care. Reassurance that prognosis following a whiplash injury is good. Future research should be founded on sound adult learning theory and learning skill acquisition. Different types of exercise can be considered for WAD, including ROM exercises, McKenzie exercises, postural exercises, and strengthening and motor control exercises. It is not clear which type of exercise is more effective or if specific exercise is more effective than general activity or merely advice to remain active. Active treatment which consists of early active mobilisation that is applied gently and over a small ROM, and which is repeated 10 times in each direction every waking hour seems to be as effective at reducing the pain after the whiplash injury as on ROM. This exercise can also be given as homework. In a randomised study by A. Söderlund et al., where the aim was to compare two different home exercise programs in acute WAD, the result was that a home exercise programme, including training of neck and shoulder ROM, relaxation and general advice, seems to be sufficient treatment for acute WAD patients when used on a daily basis. Supported by several high and low quality studies, evidence-based therapy for acute WAD consists of early physical activity, mobilisation and education. From this, we can conclude that there is strong evidence to suggest that exercise programs and active mobilisation significantly reduce pain in the short term and there is evidence that mobilisation may also improve ROM. Spinal manual therapy is often used in the clinical management of neck pain. It is not easy to tease out the effects of manual therapy alone because most studies used it as part of a multimodal package of treatment. Systematic reviews of the few trials that have assessed manual therapy techniques alone concluded that manual therapy, such as passive mobilisation, applied to the cervical spine may provide some benefit in reducing pain, but that the included trials were of low quality. For the early management of WAD grades 1 and 2, general practitioner care includes advice to stay active and resumption of regular activities. The synthesis of DA Sutton et al. suggests that patients receiving high-intensity health care tend to experience poorer outcomes than those who receive fewer treatments for WAD and NAD. Another interesting topic is the use of a collar. The use of a collar stands in contrast with what is indicated in most of the studies; activation, mobilisation and exercise. In a randomised study of Bonk et al. subjects were randomly assigned to a collar therapy group or to the exercise group. During a one week period participants had to record their average pain and disability in a diary, using the VAS scale. The results showed a significant difference between the groups, with positive effects on the prevalence of symptoms in the exercise therapy group compared to the collar group at six weeks. It is proven that early exercise therapy is superior to collar therapy in reducing pain intensity and disability for whiplash injury. Other studies also showed that exercise therapy gives a better pain relief than a soft collar. There is a difference between a patient suffering from acute whiplash and a patient suffering from chronic whiplash. There is a suggestion that the injury in combination with psychological factors may lead to chronic WAD. When behavioural therapy is used in the therapy, it decreases the patient’s pain intensity in problematic daily activities. Therefore functional behavioural analyses can be used to adapt planning and treatment. There is evidence that exercise programs have a positive result in reducing pain in the short term. Exercise programmes are the most effective noninvasive treatment for patients with chronic WAD, although many questions remain regarding the relative effectiveness of various exercise regimens. There is also evidence suggesting that coordination exercises should be added to the treatment to reduce neck pain. Multidisciplinary therapy gives positive results according to the reductions of neck pain and sick leave reported. This is also the therapy recommended by the Dutch clinical guidelines for WAD. In patients with chronic WAD, negative thoughts are a very important factor. Self-efficacy, a measure of how well an individual believes he can perform a task or specific behaviour and emotional reaction in stressful situations, was the most important predictor of persistent disability in those patients. Negative thoughts and pain behaviour can be influenced by specialists and physical therapists by educating patients with chronic WAD on the neurophysiology of pain. Improvement in pain behaviour resulted in improved neck disability and increased pain-free movement performance and pain thresholds according to a pilot study. Michaleff et al. even found that simple advice is equally as effective as a more intense and comprehensive physiotherapy exercise programme. In a case report of Ferrantelli J.R.et al., the patient underwent a Clinical Biomechanics of Posture Rehabilitation in which he received mirror-image cervical spine adjustments, exercises and traction to reduce head protrusion and cervical kyphosis. The first ten visits included regional bilateral long-lever cervical spinal manipulation to temporarily decrease pain and increase ROM, and there after the structural rehabilitation care started. This treatment consisted in mirror-image drop table adjustments, mirror-image handheld instrument adjustments, mirror-image isometric exercise and mirror-image extension-compression traction for the reduction of the abnormal anterior translation posture of the head. After 5 months, the patient’s chronic WAD symptoms were improved. As Michaleff et al. say in their article, that we can conclude that an important health priority is the need to identify effective and affordable strategies to prevent and treat acute to chronic whiplash associated disorders. Below is a listing of the various therapy techniques and studies with key evidence. 2008  Moderate evidence to support the use of postural exercises for decreasing pain and time off work in the treatment of patients with acute whiplash-associated disorders. No evidence exists to support the use of postural exercises for increasing neck range of motion. Whiplash associated disorders (WAD) are a result of a previous whiplash injury and has a variety of characteristics and symptoms. This clinical presentation can be divided into different grades, reported by The Quebec Task Force. This classification is widely used and gives recommendations about the possible therapy. When a patient has a WAD several anatomical tissues can be affected, depending on the force and direction of the impact. Some people are more likely to develop WAD than others. To diagnose WAD radiographic images are not the norm, unless it concerns a WAD Grade III and IV. It’s more useful to make a clinical diagnosis based on the clinical presentation and anamnesis. Depending on severity of the WAD different medical/surgical interventions are needed. The most common interventions are steroid injections, radiofrequency neurotomy, botulin toxin treatment, cervical discectomy and cervical fusion. Although there are a lot of medical interventions, a WAD can also be treated in a conservative way. The therapy of an acute whiplash should consist of education, where it’s made clear by the therapist to stay active and ‘act as usual’, and early physical activity and mobilization. For the management of chronic whiplash there is strong evidence that a multidisciplinary therapy is effective. This therapy also has to consist of an exercise program. Walton DM, Elliott JM. An integrated model of chronic whiplash-associated disorder. journal of orthopaedic & sports physical therapy. 2017 Jul;47(7):462-71. ↑ Spitzer WO. et al. (1995). Scientific monograph of the Quebec Task Force on Whiplash-Associated Disorders: redefining "whiplash" and its management. Spine (Phila Pa 1976)., 20(8 Suppl), pp. 1-73. ↑ 2.0 2.1 Stace R. and Gwilym S. « Whiplash associated disorder: a review of current pain concepts. » Bone & Joint 360, vol. 4, nr. 1. 2015. ↑ Graziano D.L. et al. (2007). Positive Cervical Artery Testing in a Patient with Chronic Whiplash Syndrome: Clinical Decision-Making in the Presence of Diagnostic Uncertainty. J Man Manip Ther. 15 (3), pp. 45–63. ↑ 5.0 5.1 5.2 Joslin CC. et al. « Long-term disability after neck injury. A comparative study. » J Bone Joint Surg Br., vol. 86, nr. 7, p. 1032-4, 2004. ↑ Taylor JR, Finch PM. Neck sprain. J Aust Fam Physician 1993;22:1623–9. ↑ 8.0 8.1 Jonsson H. et al. “Findings and outcome in whiplash-type neck distortions.” Spine, vol. 19, p. 2733-43, 1994. ↑ Ketroser DB. Whiplash, chronic neck pain, and zygapophyseal joint disorders. A selective review. Minn Med J 2000;83(2): 51–4. ↑ 12.0 12.1 HOLM L.W. (2008). The Burden and Determinants of Neck Pain in Whiplash-Associated Disorders After Traffic Collisions: Results of the Bone and Joint Decade 2000 –2010 Task Force on Neck Pain and Its Associated Disorders. Eur Spine J., 17(Suppl 1), pp. 52–59. ↑ 13.0 13.1 13.2 Loppolo F. et al. (2014). Epidemiology of Whiplash-Associated Disorders. Springer-Verlag Italia. ↑ Walton D.M. (2009). Risk Factors for Persistent Problems Following Whiplash Injury: Results of a Systematic Review and Meta-analysis. J Orthop Sports Phys Ther, 39(5), pp. 334–350. ↑ 24.0 24.1 24.2 24.3 24.4 Delfini R. et al. (1999). Delayed post-traumatic cervical instability. Surg Neurol.,51 Pp.588-595. ↑ 25.0 25.1 25.2 25.3 25.4 Sterling M. (2004). A proposed new classification system for whiplash associated disorders-implications for assessment and management. Man Ther., 9(2), pp. 60-70. ↑ 27.0 27.1 Suissa et al. (2001). The relation between initial symptoms and signs and the prognosis of whiplash. Eur Spine J. 10, pp. 44-49. ↑ 32.0 32.1 32.2 32.3 32.4 32.5 32.6 32.7 32.8 32.9 BINDER A., The diagnosis and treatment of nonspecific neck pain and whiplash, Eura Medicophys 2007, vol. 43, nr. 1, p. 79-89. ↑ CHIEN A. et al., Whiplash (grade II) and cervical radiculopathy share a similar sensory presentation: an investigation using quantative sensory testing, Clin J Pain 2008, vol. 24, nr. 7, p. 595-603. ↑ 40.0 40.1 EVANS RW. , Persistent post-traumatic headache, postconcussion syndrome, and whiplash injuries: the evidence for a non-traumatic basis with an historical review, Headache 2010, vol. 50, nr. 4, p. 716-724. ↑ GUO LY et al., Three-dimensional characteristics of neck movements in subjects with mechanical neck disorder, J Back Musculoskelet Rehabil., 2012, vol. 25, nr. 1, p. 47-53. ↑ 43.0 43.1 Rodriquez A. et al. (2004). 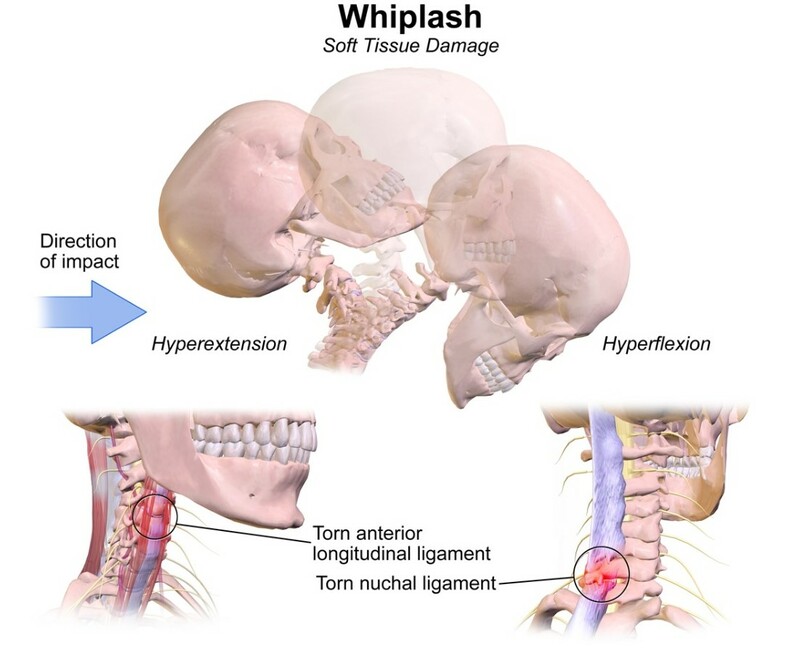 Whiplash: pathophysiology, diagnosis, treatment, and prognosis. Muscle Nerve, 29, pp. 768-81. ↑ Eck JC. Et al. Whiplash: a review of a commonly misunderstood injury., Am J Med., 2001;110:651–6. ↑ 46.0 46.1 Van Goethem J. et al., Whiplash injuries: is there a role for imaging?, Eur J Radiol., 1996;22:30–37. ↑ 47.0 47.1 Stiell IG et al., The Canadian c-spine rule versus the NEXUS low-risk criteria in patients with trauma., N Engl J Med., 2003;349(26): 2510-2518. ↑ 49.00 49.01 49.02 49.03 49.04 49.05 49.06 49.07 49.08 49.09 49.10 Clinical guidelines for best practice management of acute and chronic whiplash-associated disorders: Clinical resource guide, TRACsa: Trauma and Injury Recovery, South Australia, Adelaide 2008, p. 46-69. ↑ STENNEBERG MS. et al. « Validation of a new questionnaire to assess the impact of Whiplash Associated Disorders: The Whiplash Activity and participation List (WAL) » Man Ther. vol. 20, nr. 1, p. 84-89, 2015. ↑ SEE KS. “ Identifying upper limb disability in patients with persistent whiplash. “ Man Ther, vol. 20, nr. 3, p. 487-493, 2015. ↑ ANGST F. et al. (2014). Multidimensional associative factors for improvement in pain, function, and working capacity after rehabilitation of whiplash associated disorder: a prognostic, prospective, outcome study. BMC Musculoskelet Disord., 15, 130. ↑ Sterling M. et al. (2004). Characterization of acute whiplash-associated disorders. Spine (Phila Pa 1976)., 29(2), pp. 182-188. ↑ Barnsley L. et al. “Lack of Effect of Intraarticular Corticosteroids for Chronic Pain in the Cervical Zygapophyseal Joints” N Engl J Med., vol. 330, p. 1047-1050, 1994 . ↑ 56.0 56.1 Conlin A. et al. Treatment of whiplash-associated disorders-part II: Medical and surgical interventions: Pain Res Manag. 2005, vol. 10, nr. 1, p. 33-40. ↑ 57.0 57.1 Pettersson K. et al. “High-dose methylprednisolone prevents extensive sick leave after whiplash injury. A prospective, randomized, double-blind study” Spine, vol. 23, nr 9, p. 984-9, 1998. ↑ Smith AD. Et al. Cervical radiofrequency neurotomy reduces central hyperexcitability and improves neck movement in individuals with chronic whiplash: Pain Med. 2014 vol. 15, nr. 1, p. 128-41. ↑ Prushansky T. et al. (2006). Cervical radiofrequency neurotomy in patients with chronic whiplash: a study of multiple outcome measures. J Neurosurg, 4(5): p.365–373. ↑ Freund BJ. Et al. « Treatment of whiplash associated neck pain with botulinum toxin-A: a pilot study » J Rheumatol., vol. 27, nr. 2, p. 481-4, 2000. ↑ Baker JA and Pereira G, The efficacy of Botulinum Toxin A for spasticity and pain in adults: a systematic review and meta-analysis using the Grades of Recommendation, Assessment, Development and Evaluation approach, Clin Rehabil 2013, vol. 27, nr. 12, p. 1084-1096. ↑ Nigam PK. and Nigam A.. BOTULINUM TOXIN. Indian J Dermatol: 2010. vol. 55, nr. 1, p. : 8–14. ↑ Teasell RW. et al. A research synthesis of therapeutic interventions for whiplash-associated disorder (WAD): Part 5 – surgical and injection-based interventions for chronic WAD. Pain res manag: 2010. vol. 15, nr. 5, p. 323-334. ↑ Motor accidents authority (2001). Guidelines for Management of Whiplash-Associated Disorders: 8. ↑ 66.0 66.1 66.2 66.3 66.4 66.5 66.6 66.7 66.8 Meeus M. et al. Pain Physician. The efficacy of patient education in whiplash associated disorders: a systematic review. 2012 Sep-Oct;15(5):351-61. ↑ 70.0 70.1 70.2 Rosenfeld M. et al.(2000). Early intervention in whiplash-associated disorders: a comparison of two treatment protocols. Spine, vol. 25, nr. 14, p. 1782-7. ↑ Söderlund A. et al. (2000). Acute whiplash-associated disorders (WAD): the effects of early mobilization and prognostic factors in long-term symptomatology. Clin Rehabil. 4(5):457-67. ↑ Conlin A. et al. (2005). Treatment of whiplash-associated disorders-part I: Non-invasive interventions. Pain Res Manag 10(1):21-32. ↑ TEASELL RW. Et al., A research synthesis of therapeutic interventions for whiplash-associated disorder (WAD): part 4 - noninvasive interventions for chronic WAD, Pain Res Manag 2010, vol. 15, nr. 5, p. 313-322. ↑ SÖDERLUND A. and LINDBERG P., An integrated physiotherapy/cognitive-behavioural approach to the analysis and treatment of chronic whiplash associated disorders, WAD, Disabil Rehabil 2001, vol. 23, nr. 10, p. 436-447. ↑ 84.0 84.1 Michaleff ZA. et al., Comprehensive physiotherapy exercise programme or advice for chronic whiplash (PROMISE): a pragmatic randomised controlled trial, Lancet. 2014 Jul 12; 384(9938):133-41. ↑ FERRANTELLI J.R. et al., Conservative Treatment of a patient With Previously Unresponsive Whiplash-Associated Disorders Using Clincal Biomechanics of Posture Rehabilitation Methods, J Manupulative Physiol Ther. 2005, vol. 28, nr. 3, p. 1-8.